These simple & pretty Crab Salad Stuffed Avocados are light and delicious and make a perfect Spring or Summer lunch! Picture enjoying one of these loaded avocados by the pool, as a starter for an evening dinner party or as an offering at a BBQ, bridal or baby shower. The plating will make your guests excited and chatter about something you make is always fun! You can make these Crab Salad Stuffed Avocados to order or put them out for guests to pick up on a buffet. You can serve them in or out of the skin (I like using the skin as my bowl) or with the avocado sliced and fanned out, your call. 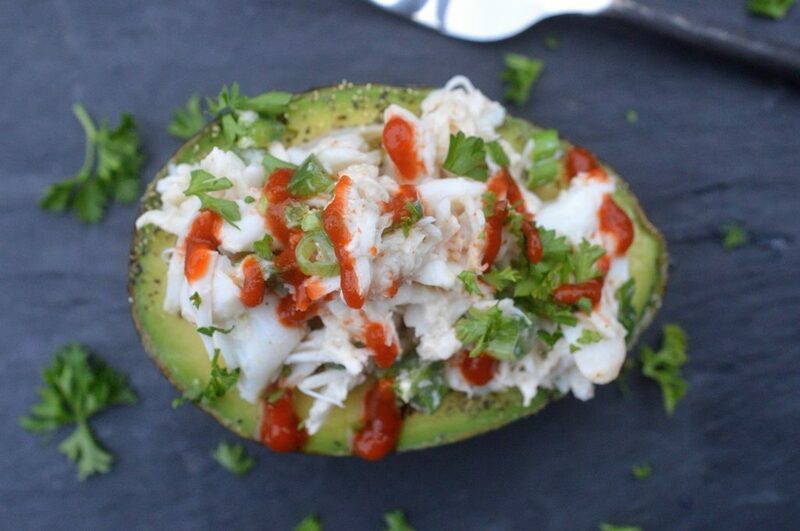 Luxurious jumbo-lump crab meat paired with creamy avocado, YUM! If you like heat, the Sriracha ties it all together! 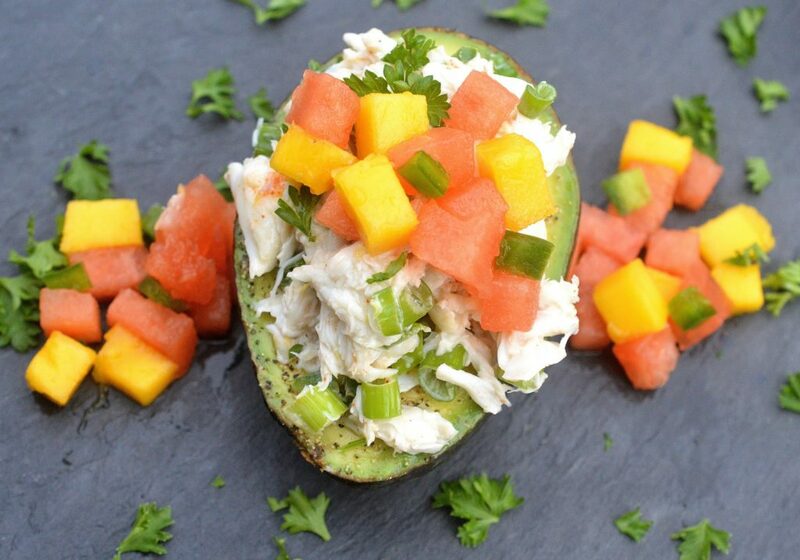 If you are not a fan of heat and would like to top your Crab Salad Stuffed Avocados with something light and fruity, simple dice up some watermelon & mango, give it a squeeze of lime, toss and you are good to go! 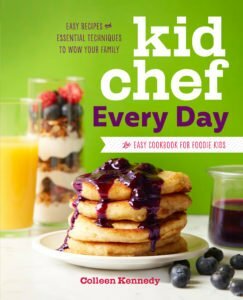 I’ve happily partnered with California Avocados again this year to share recipes I come up with each month during their growing season using their scrumptious avocados. It’s kind-of insane what you can do with an avocado…Right?? I mean simply popping one open, seasoning it, giving it a squeeze of lemon or lime and then digging in….is magical by itself, however where you can take it? Oh man! It’s fantastic! I paired Avocado and crab in a recipe last year too with these Avocado Crab Cakes with Bacon & a Spicy Avocado Remoulade (pictured below). You WANT to try them, seriously! 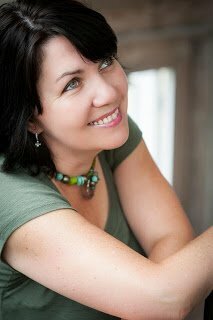 I know…I get a little too excited by food, lol! From Guacamole to dressings to salads, entrees and more, you can get your avocado on. And for breakfast…YES!! Like in the Avocado Breakfast Pizza I made last month. My 14 year old son went bonkers for it! California Avocados are loaded with good things, they provide nearly 20 essential nutrients, including fiber, potassium, Vitamin E, B-vitamins, and folic acid. To find out about their full nutritional value, visit their website where you will also find recipes, tips and up to the minute information they even tell you how to try to grow your own Avocado Tree from an avocado seed. What’s your favorite thing to do with an avocado?? If you are not into shellfish or meat in general, try my super popular Caprese Stuffed Avocados, you may just fall in love! I actually have loads of avocado recipes on my site, some are pictured below. To find them, simple search “avocado” on the right sidebar of my site, just under the “popular posts” photos (or click here ). I hope you give this recipe or one of my many avocado recipes a try! If you do, tag me @soufflebombay on Instagram or Facebook with your creation! These Crab Salad Stuffed Avocados are easy to make and make a fantastic light lunch, starter or baby/bridal shower offering. Drain your crabmeat. Place it in a bowl, season with salt & pepper. Add in mayo, scallions and jalapeno. Zest 1 lemon into the bowl followed by a squeeze of lemon juice to brighten it up. Slice avocados, put them, season avocados with salt & pepper. You can even drag a fork through them to dig them up a bit if you like. Top with crab salad, sprinkle with parsley. 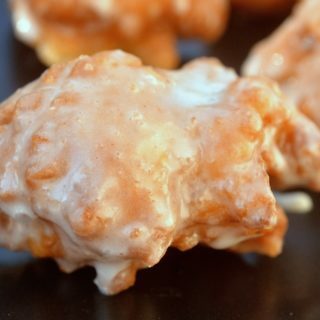 Drizzle with Sriracha and serve. You can add as little or as much mayonnaise as you like. No rule for this, just your preference. If you don;t enjoy the potential heat of a jalapeno (you never know with those little guys) substitute minced red, yellow or green pepper. f you opt for the Watermelon Mango Salsa vs the Sriracha, simply small dice both watermelon and mango, spritz with some fresh lemon and top your stuffed avocados with it. Make extra, I eat bowls of that when summer is in season...sometimes I add minced jalapeno to it as well. Looks magnificent!!!! 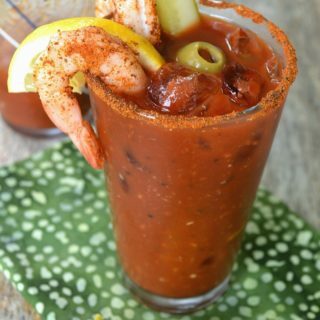 I am allll over this – with my mouth! ha! Being the avocado loving freak that I am, I love this! 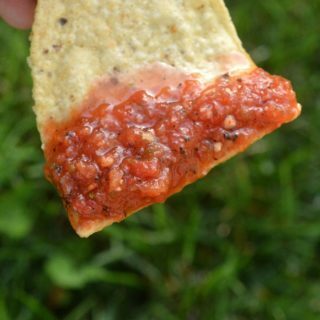 I am super intrigued by the addition of watermelon salsa ! I bet it brings out the flavor of the crab so much more! I’m SO eating this next week for lunch! I like to add the salsa to my cooked crab cakes too, yummo! Mmm loaded avocados are my new addiction! Love it! 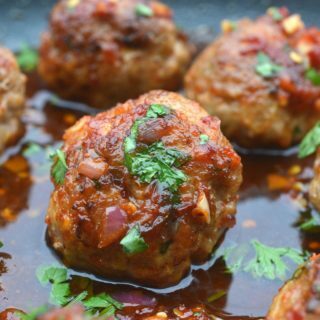 I am absolutely in love with this recipe, what a great idea! We don’t many California avocados here though, mostly the Mexican, and those low fat Florida avocados. So smart to stuff these with a crab salad! 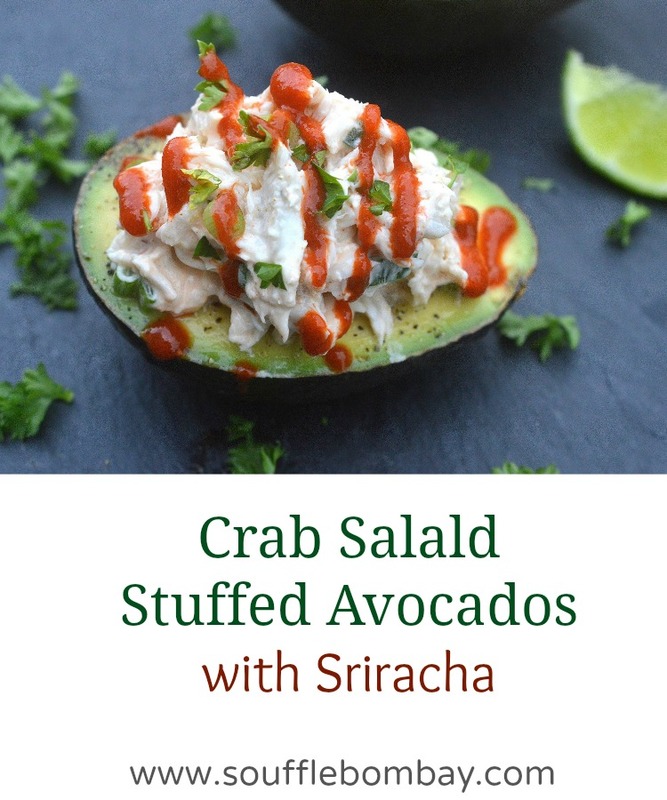 I’ve seen tons of stuffed avocados before but never have I seen ones with crab! I’m in love!